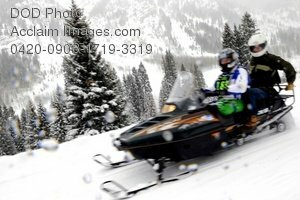 Description: Free, public domain image: Men on a Snow Mobile. Senior Airman Kevin Krogh drives a snow mobile Apr. 1 during the 23rd National Disabled American Veterans Winter Sports Clinic in Snowmass Village, Colo. Airman Krogh lost both legs in a major car accident in 2007 and this will be his first year attending the sports clinic. Airman Krogh is assigned to Fort Sam Houston in San Antonio. (U.S. Air Force photo/Staff Sgt. Desiree N. Palacios.